We cannot remember ever working in temperatures this low. As Mother Nature teaches us new things about farming in the winter, she has thrown us a few icy curve balls. I use the word us, but I really mean Rob. Being a new mom comes with a few perks, like snuggling with the baby near the warm fire. Rob on the other hand, has been catching these curve balls and pushing forward to get the January winter share ready. Rob came in from working a somewhat frustrating day on Wednesday and he described his day as if he were Medusa. Instead of everything he looked at turning to stone.. it was everything he touched broke. These sub zero temperatures have created unexpected hurdles. A few examples from Rob’s day: The hydraulic controller for our tractor mounted forklift somehow got the tiniest bit of water in it and made the forks inoperable… making it necessary to take it apart and let it thaw by the fire before being able to use it. All the root vegetables that we have in storage are packed into our cooler in 800# bins. We stack these bins 3 high with the tractor before wheeling them in there with a pallet jack; this is a clever way to maximize the vertical space in our cooler but requires the use of the tractor to un-stack when we need to access the veggies. That hurdle was somewhat minor but the issue in the scene featured in the photos above was a little more serious. 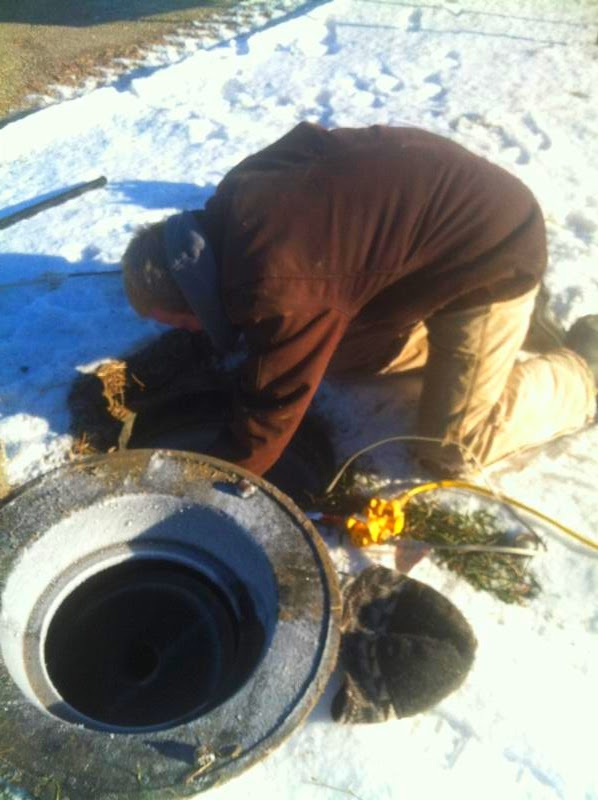 Above you see Rob is laying on the icy ground and climbing belly first into an icy hole to thaw out a frozen water pipe and water meter to enable us to wash all those delicious roots. This may seem crazy…and it is, but if you know Rob this is normal. Rob is quick on his feet and throws everything he has mentally and physically at a problem that needs solving. I fear this stubbornness is a blessing and a curse, no doubt it is what makes him the engine. 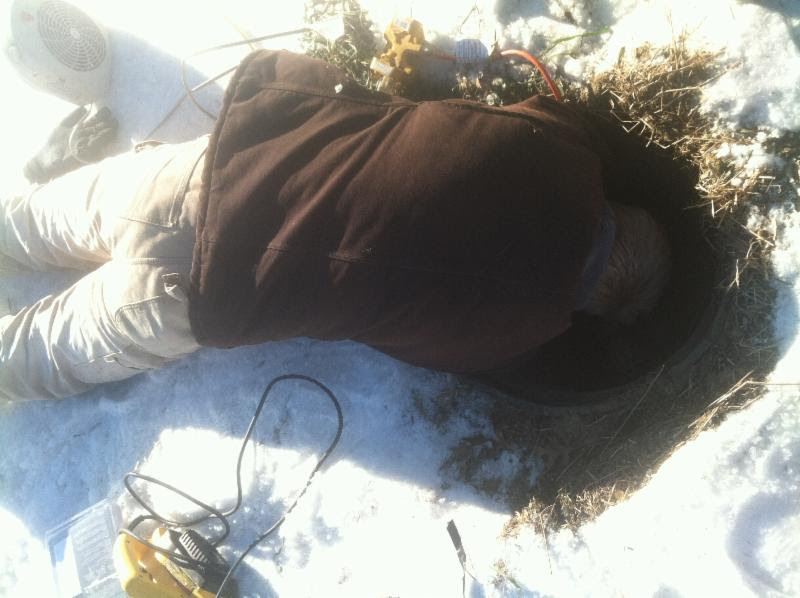 In all the years I have known and worked with Rob his fierce determination has had him climbing into, ditches, freezing rivers, under stuck tractors, and frozen manholes to do his job and bring vegetables to our family and our members. So as we enjoy these vegetables from our January share, we should not only thank Andrew and Jason for braving the cold to get the share ready. We should bring Rob a hot drink or a little scotch to warm the belly and thank him for all his hard work. In this months share despite the icy cold we’ll be bringing out a little reminder of this past summer in a jar. Our own tomato puree will be a part of this months share along with the root crops and spinach listed to the left. This is a special treat for sure. These were our tomato seconds from the summer that our friends at Appalachian Naturals processed and canned in their certified processing facility. These jars are sealed so they can sit in your pantry till you are ready to use them. Think about summer as you enjoy a little taste of it! On behalf of the farm crew Andrew and Jason.